I’d asked for a Kindle as a Xmas present, judging that would be the cheapest to get. 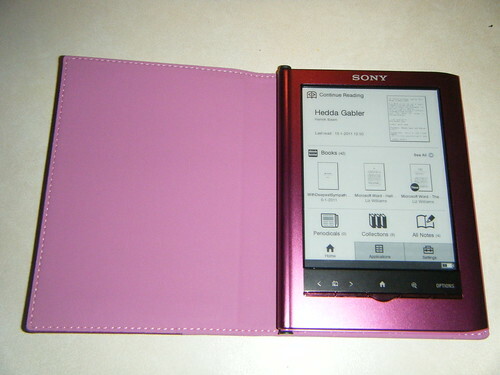 So, I was very surprised to get a Sony Pocket eReader (350 model in pink!) instead. Have become a convert very quickly, as it’s great for carrying around in my bag, reading on the bus, or in cafés, and for taking on weekends away. The plan is to use it to read lots of the freely available, out of copyright, classics I’ve never read. Loaded it up with titles from authors such as Dickens, H.P. Lovecraft, M.R. James, Edgar Allan Poe, E.M. Forster, Oscar Wilder, Rudyard Kipling, Arthur Machen, Conan-Doyle, Bram Stoker, Jules Vern, and Mark Twain. Plus some Cory Doctorow titles and some short stories by friends. Also found it good for reading drafts of novels/scripts that I’ve been sent to critique by friends. Really nice size (a little smaller than the Kindle), which means I can hold it with one hand, while drinking a cuppa, and it doesn’t put any strain on my wrist. The page turning buttons on the bottom can easily be pressed while still holding it in one hand, so no need to put my cuppa down. It also allow you to turn the pages via the touch screen but that’s a little more fiddly. Touch screen is really easy to use. Has a stylus for use in the trickier screens, like the touch screen keyboard. Can handwrite notes on the books pages and highlight text (and delete). Can add bookmarks (and delete). Can draw pictures on it! Double clicking on a word will bring up the OED definition. Remembers what page you got to on any book/document you go into, so you can have several titles on the go at once. Can read PDFs and if they are text only will also re-size/word wrap in the same way it does for the native ePub format – though you do get the odd formatting issue with PDFs. Being able to sort books into self-titled collections. and I haven’t even used all the functions yet! That you have to hook it up to your computer to add/delete books and recharge it. (No wifi). The software provided for your computer (Reader Library), has a tendency to crash. Though it’s fairly easy just to move stuff across to the reader as if it’s an external drive anyway without software. You can’t do anything with the drawings you’ve made because they’re SVG (scalable vector graphics) & I haven’t been able to figure out how to convert them into jpgs. Not really usable for comics. We’ve put a copy of an issue of one of our small press comics on in PDF and the pictures show up pretty well in b/w or greyscale (as the screen isn’t colour) but obviously they’re too small to read and it can’t resize them. Can zoom but really fiddly, so any comics would have to be done as a panel at a time, as they’re are for other small screen devices. I still love printed books, but this is certainly much, much easier to use on the move. I did a training session on eBooks and eReaders for some of our library staff yesterday, and they found it really useful to see the difference between our online library subscribed ebooks, and the type of ebooks you would download on to an eReader. eBook discussion are popping up in all areas of my life at the moment, from print vs e on the British Fantasy Society forum, the new Doctor Who book by Michael Moorcock being available on the Kindle, to creating comics for the iPhone/Pad, to students asking about them in inductions, to many friends having just bought Kindles or iPads… so a very hot topic, particularly since the Kindle came down in price recently. What is an eBook? A document that can be read on an eReader? Via computers, laptops, dedicated readers (Kindle, Sony eReader), iPad, iPhone, iTouch? Many different routes, some of which require the eBooks in certain formats. There is now a Kindle app for non-Kindle devices to allow people to buy ebooks from Amazon. PDF – the favourite of academic journal publishers and still very popular with other publishers as an easy format for them to provide, but not a format that works well on dedicated eReaders. Doc (word docs), txt (plain text), html. Mobi (Mobipocket) format – used by the Kindle. ePub format – used by Sony. Why use an eReader instead of a laptop/ipad etc? eReaders like the Kindle and Sony use electronic paper technology, which mimics what ink looks like on paper. The theory being that tis makes is much easier to read the text and easier on the eyes. (Friends with a Kindle have commented they find it much easier to read than a computer screen). Computer screens are backlit making them much brighter, and possibly causing more eye strain. Are younger readers more used to this technology? Formats like Mobi and ePub are also designed to resize easily to the size of the device and reader requirements than traditional formats. it is very easy to convert a Word document to various eBook formats using free software like calibre. (We have a go, it really is easy!). Calibre can also act as an eBook file organiser. e.g. inplace of iTunes on the Sony eReader. Public libraries in the USA and Hampshire Libraries in the Uk have started experimenting with loaning eBooks using the Overdrive system. However, the Publishers Association have just announced new restrictions that look set to put a stop to a lot of eBook lending options!! Lots of free (mainly out of copyright or creative commons) eBooks out there on services such as Project Gutenberg, Feedbooks and Manybooks. Amazon have a new feature on all their book pages that allows you to ﻿﻿﻿﻿”Tell the publisher, I’d like this book on the Kindle” – is this where the pressure for eBooks will come from in future? Also a very interesting piece by SF&F writer Charles Stross on why eBooks don’t cost much less to produce than printed books. I’m sure there’s been lots more stuff out there that I’ve forgotten, anyone? Will Ebooks finally have their day? I ask the question following on in part to a discussion myself and Selina were having this morning about the economics of eBooks and eReaders; now the big boys like Amazon and Sony are getting into the game. Then what do I read in the latest CILIP Gazette? But a front cover article on eBooks/readers. Is this (finally) the beginning of the end for the printed word in the library, meaning we can switch more floor space over to student study – or will it take years for people to take it up? I know I’ve already spoken with more than one student in recent years who was hoping we’d go down the ebook only route sooner rather than later. I just don’t want to be the one on the end of the phone explaining the authentication routine for her non-standard ebook reader bought at Aldi*. Will they all read PDF or are there going to be other new standards? Will we have to upgrade all our stocks data format; data preservation techniques are hardly robust enough as it is let alone bringing in issues like ensuring future accessibility. *I speak with bitter experience here of Aldi’s cheap but annoyingly non-future proofed bargin priced tech peripherals!